Good meetings result in defined tasks, defined tasks need meetings to follow-up. In a business environment, it's also essential to track decisions, create and distribute meeting invitations, reminders and minutes. To meet all these business requirements in iMeetingX, we have expanded the easy to use Getting Things Done task management tools with advanced meeting organization and automatic meeting minutes management options. Getting Things Done for Business has also a strong focus on projects, which are now commonplace in business environments. To cater for this project focus, a project can be created as a single project file in iMeetingX that contains information on an unlimited number of meetings, as well as actionable/actioned items, attachments, and can be stored in a user-specified place. Many companies and organizations use Windows and macOS - No problem! iMeetingX is available for both platforms and sharing project files between these platforms flows naturally and without problem. The iMeetingX task management is a very rich and flexible feature; One can create action items, list requirements and decisions, jot down ideas and notes, assign items to responsible persons, catalogue meeting minutes and agenda items, add unlimited attachments, set deadlines, etc. 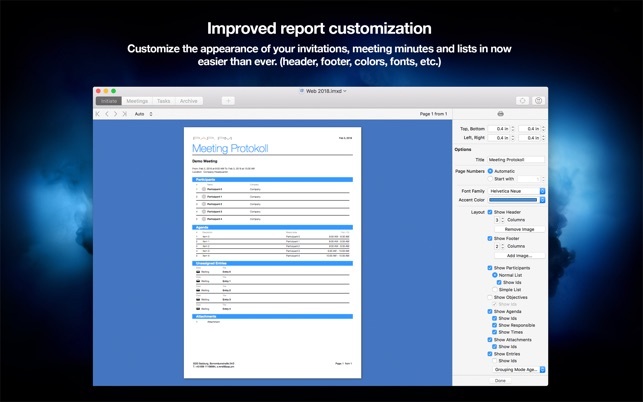 One of the most powerful features in iMeetingX is Smart Lists. With Smart Lists, one can clearly define the goals and intended deliverables of a project, with emphasis on the most important items, enabling immediate and goal-orientated actions. iMeetingX is the most efficient software to easily create, and distribute, meeting invitations, reminders and minutes. One can create meeting invitations that include the agenda and any other necessary information, by either choosing one of the integrated templates provided or simply creating a new one- easy and fast. With a single click, the invitation can be distributed to all or a selection of project co-workers. 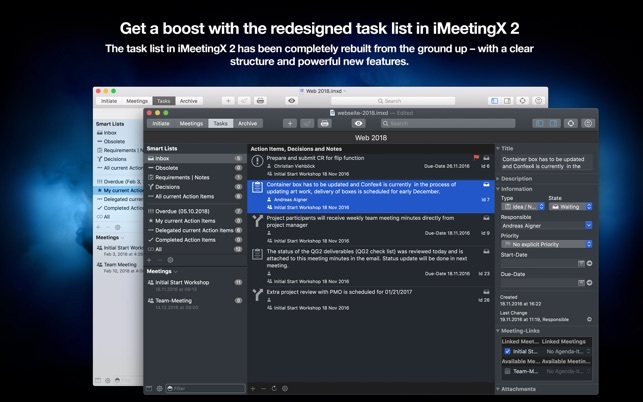 iMeetingX automates most of the work in creating meeting minutes. All one has to do is assign action items, decisions and notes from a meeting. After the meeting, valuable time is generally required to write-up meeting minutes and distribute them to all participants - iMeetingX will do this with a single click! Do it all much faster than before! No more juggling information in separate tools like email, word processing applications, file sharing services or a separate task manager. 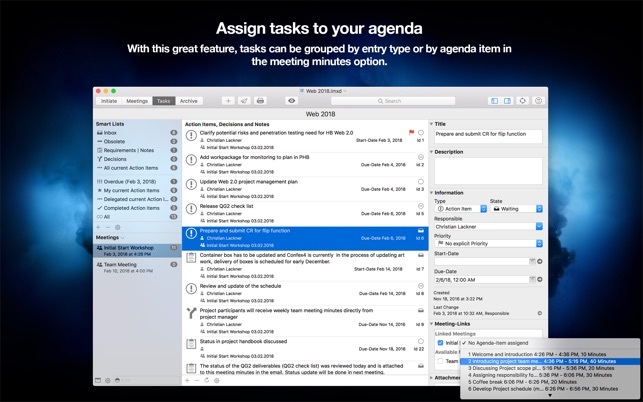 The central task list in iMeetingX includes action items, decisions, notes and requirements that will ensure that things get done, are traceable and are on time. One can add action items and ideas including notes during daily project work and assign them later to a relevant meeting. 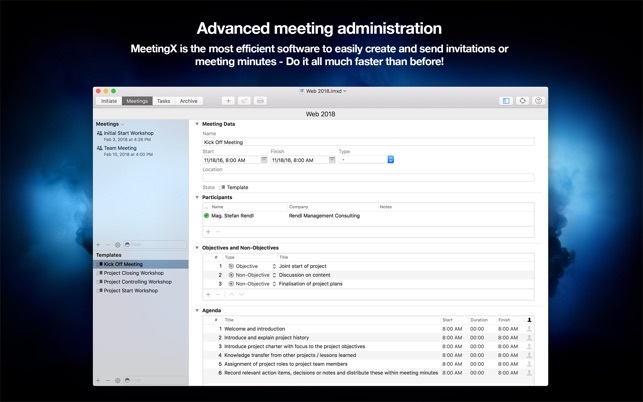 With iMeetingX, additional time is not required to write up meeting invitations or minutes in a separate word processing application. 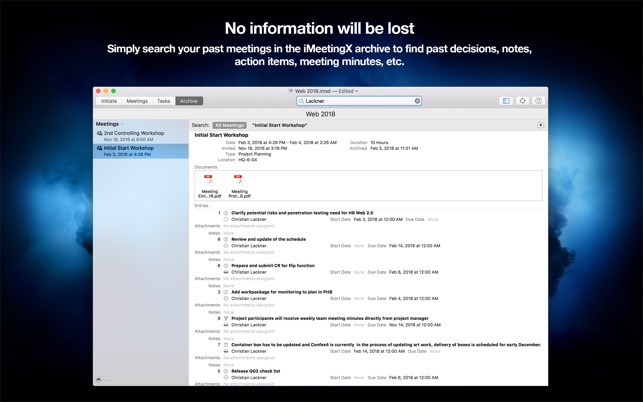 Simply search your past meetings in the iMeetingX archive to find past decisions, notes, action items, meeting minutes, etc. He comprado el producto y consigo que es funcional, almacena el historico de las reuniones y cuando finaliza la actividad tienen la posibilidad de enviar el producto final directamente a las correos de los participantes.